Classic VW Flower Bus hippie van surf beach cruiser auto biography. Story includes history, facts, and information about Volkswagen magic surfing bus van. 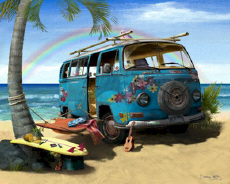 VW Flower Bus Surfing Beach Cruiser History - Volkswagen Hippie Van Story. Since the advent of the automobile age a century ago, the beach cruiser has become a nostalgic presence found along ocean shorelines worldwide. As with our Volkswagen Flower Bus, the typical beach cruiser is usually old and rusted, and always an integral part of the local beach and surfing culture. To those who cast only a cursory glance, the cruiser is often seen as little more than an unwelcome eyesore. But to those who look beyond its rusty and faded skin, the cruiser is truly the embodiment of a unique lifestyle marked by sun, sand, salt and surf. If the cruiser could only speak, what a story it would tell! Back in 1972 our Flower Bus rolled off a far away assembly line with the shine and new car smell that made it a prized possession. No doubt more than one young cruiser-to-be drove along a coastal highway and thought to itself, "When I get old I'll never look like that!" And in the naïveté of youth the shiny new cruiser-to-be simply turned its head and continued down the road -- probably headed for the pleasure of a pleasant car wash and the protected comfort of its own garage. But change is inevitable, especially in the automobile industry where styling and mechanical advances are a never-ending demand. In the span of a few short years our Volkswagen Flower Bus was no longer the newest and latest. Indeed before long it's likely our cruiser found itself in the hands of a second or third owner where utility rather than the latest look became the top priority. Our Flower Bus undoubtedly experienced a less pampered existence as the harsh realities of life now took center stage. Fast-forward a decade or two and for most cruisers life has evolved from a world burdened with few concerns to one focused on day-to-day survival. Routine maintenance and regular washing, let alone an occasional polishing, are a thing of the past. Minor dings and emerging rust spots are ignored. The ethos becomes "keep running and deal with this new, harsher life -- or else". Or else the junkyard and the car crusher may be just one breakdown away. Where does the classic beach cruiser come from? Cruisers come from hills of West Virginia, the plains of Kansas and the mountains of Colorado. They come from the snow of Vermont, the desert sun of Arizona and yes, the sunny shores of Florida, California and Hawaii. Some live their entire pre-cruiser existence without having ever inhaled a breath of salt air. What nearly all cruisers do have in common however, is the good fortune to have been spotted by someone (probably a young surfer) who cared little about looks. The job description is simple. "Can you carry my board and myself faithfully to the beach everyday? Will you wait patiently without complaint in the warm sun and then faithfully carry us home again?" If the answer is yes, another beach cruiser is born. Some cruisers have had incredible life experiences that would make many of us feel our lives have been quite mundane. For example in our print collection you will find a Woody that carried a President and later toured with the Beach Boys. And there is an old Chevy cruiser that once was Elvis' favorite getaway car and a Volkswagen cruiser that came within a hair’s breadth of becoming a movie star. Still another, a rusted Mustang cruiser whose owner worked at a recording studio, inspired a hit record. But accomplishments and past life experiences don’t really matter very much on the world's surfing beaches. What defines a cruiser? The obvious things are a surfboard rack, a generous dose of rust, duct tape (and occasionally baling wire), bungee cords, tires and body parts that don't match -- and of course lots of dings. But it is what lies beneath the cracked and faded paint that really matters. It is the character and wisdom that comes with age as well as an appreciation for life that defines a beach cruiser. It's not about good looks or past glories. It's about a spirit and a special way of life. The past doesn't matter and the future lies no further ahead than the next breaking wave. We see character and wisdom etched in the leathery face of an elderly person or in the facade of an old building. That same character and wisdom are found in the rusted and wrinkled sheet metal of the beach cruiser, most of whom have lived longer and seen far more of life than their younger owners. As our Volkswagen Flower Bus will testify, it's not about looks and status. The young and beautiful have their time and place. But to have survived and to be able to live one's Golden Years parked on the sands of a sun-drenched beach is the ultimate reward. Leisurely passing time with fellow cruisers while your owner endlessly searches out that perfect wave is truly Paradise – the Paradise of being a beach cruiser.